The leading provider of innovative consumer products, ZAGG Inc. has announced the upcoming availability of its new sturdy ZAGGmate iPad case, which the company describes as the perfect companion for your beloved Apple iPad, featuring a hinge stand, and optional wireless Bluetooth keyboard for easy typing and the QWERTY keyboard also offers special function keys for music control, volume control and so on. ZAGGMate is crafted of aircraft aluminum with a bead-blasted, hard-anodized finish to fulfill your modern lifestyle, delivering industry-leading drop protection thanks to the military grade high-density padding. 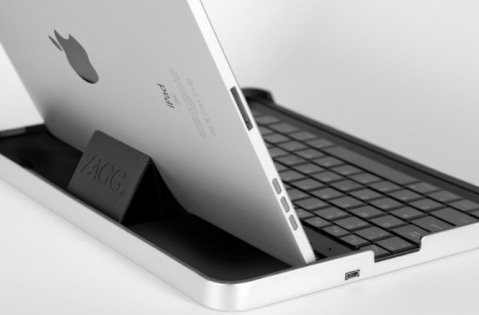 The new cool, stylish and lightweight ZAGGMate iPad case with Bluetooth keyboard which has been honored with International CES Innovations 2011 Design and Engineering Awards is scheduled to be available beginning November 26 for around $99.99, while the ZAGGMate without keyboard is priced at $69.99.